Fox Creek Leather Loves Our Visitors! We welcome customers into our retail store, here in Independence, VA. We want you to come in, take a look and try something on! Let our expert employees help size you in the gear you want. We have had people make the trek all the way from California, Colorado, as well as Canada, New Zealand, Great Britain, Germany and more. 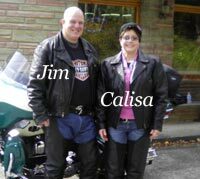 Jim and Calisa came from Logan, WV. They stopped in on their way to Gatlinburg, TN earlier this month. Calisa is stylin’ in our Women’s Fitted Classic Jacket. Retired Air Force buddies Dan, Steve and Joel hadn’t got together in about 4 years. Dan and Joel are from North Carolina but Steve traveled all the way from Colorado to meet up. They try to get together ever so often and keep in touch. We’re glad they made us a stop on their trip. Judy, Larry, Wendy and Scott traveled from Georgia. Scott surprised his dad by buying him a Grayson Motorcycle Jacket as an early Christmas present! 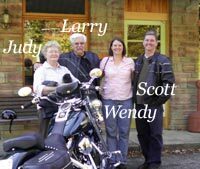 Judy doesn’t ride motorcycles; but, she does follow the trio in her truck with their 3 dogs. Morris is one of Rachel’s favorite customers. He came from North Carolina by way of Tennessee and came into the store with his “grocery list”. Rachel helped him find everything on the list and he even added a vest! Rachel said he was a pleasure to work with. 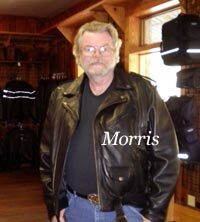 He looks great in his new Classic I Motorcycle Jacket.